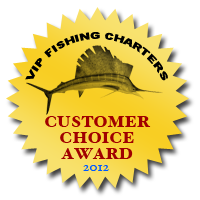 We are one of the only fishing charter operations to specialize in Fort Lauderdale corporate entertaining. Our fleet is far above average when it comes to boat quality, cleanliness and appearance. Of course, we also have great captains and crew who have expert local Fort Lauderdale fishing knowledge and experience and will help your group catch a lot of fish! We also have Fort Lauderdale sport fishing yachts available for charter. Though our standard sport fishing boats are very nice, if you're looking to impress, we can arrange a charter on one of our multi million dollar sportfishing yachts. These Fort Lauderdale fishing yachts truly shine inside and out. They have high end interiors and the crew is used to dealing with elite clientelle. Our corporate entertaining charters include the fishing boat, the captain, a mate, equipment and fuel. Beyond our standard package, we can also arrange special add ons to our charter for the purposes of corporate entertaining. This can include catering, additional crew, limo transportation to and from the charter, and even massage therapists. Basically, if you can think of it, we'll do our best to try and arrange it.